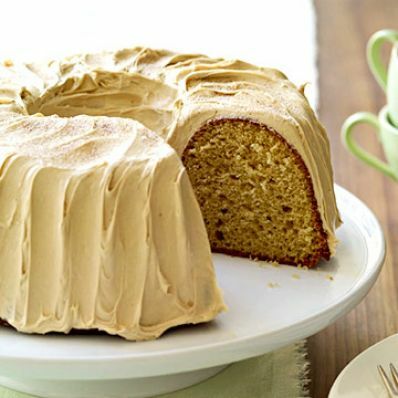 1 of 5 Heat oven to 350 degrees F. Coat a 10-cup bundt pan with nonstick cooking spray. 2 of 5 In a large bowl, beat cake mix, melted ice cream and eggs on low speed for 1 minute. Beat 2 minutes on medium speed. Scrape into prepared pan. 3 of 5 Bake at 350 degrees F for 35 to 40 minutes or until wooden pick inserted in center of cake comes out clean. Cool in pan on wire rack for 20 minutes. Invert onto wire rack to cool completely. 4 of 5 In large bowl, beat together frosting and instant coffee mixture. 5 of 5 Place cake on stand and spread with frosting. Refrigerate until ready to serve. Dust with cinnamon sugar, if desired. Per Serving: 70 mg chol., 5 g sat. fat, 43 g carb., 14 g Fat, total, 0 g fiber, 4 g pro., 271 mg sodium, 314 kcal cal.